Hooray, it's here! It's December and in our house that means the Christmas build up can officially begin. Songs can be sung, films can be watched and before too much longer, halls will be decked. If you've been hanging around here for a while you might know that I'm a big fan of the festive season. I do love the sparkle and the excess, the excitement of anticipation, the warm glow of the fire and the twinkle of the tree lights. In fact I sometimes find it quite hard to wait for the 1st of the month to roll round, so when the festive mood struck me on a lazy sunday last weekend, I gave in the the feeling and allowed myself a little pre-festive treat. I wanted to make some stars, something to add to wrapped presents for an extra decoration. I hadn't planned on making my own, I'd seen plenty of stars about and so I hooked a few, trying out different patterns. A lot of them came out pretty big though and some of them were a little fiddly for my taste. I wanted something teeny tiny and super quick and easy, so I decided to make things as basic as possible and hooked up these little cuties. Incredibly simple and speedy and just the right combination of festive and lazy - prefect for December weekends. I showed these stars to the kind and wonderful people of Instagram and as well as being their usual sweet and complimentary selves, said that they might be able to find a use for such stars themselves. So for them and for you too, I thought I'd share my Twinkler Star pattern. A little Christmas star cheer for you to sprinkle around. ROUND 1: Chain 5 and make a ss into the 1st chain to form a loop. ROUND 2: Chain 3 and make 2tr's into loop, 1 ch, (3tr into loop, 1ch) 4 times, ss to top of starting chain. ROUND 3: ss into next tr, *(2tr, 1dtr, 3ch, 1dtr, 2tr) into next ch sp, ss into the middle tr of next group of 3*, repeat from * to * 5 times. I quite like the rounded off style of the corners but of course you could also pin them out and make them nice and pointy too. Just give them a spray of water to make them keep their shape. Or, if you want them nice and stiff to hang up on the tree, try spray starch, or better still, paint their backs with pva (white) glue. Aaaah, lovely! Thanks for sharing, Sandra!! These are way cuter (and easier to make) as the ones of the star garland I made recently. Fun to make aren't they? I also like to make little stars for Christmas!! Sandra, thank you, you're a star - love a chart to work from. Will be making some of these for the tree and presents. these are so pretty! Thanks for sharing the pattern. I love your stars, especially the tiny ones in gold! 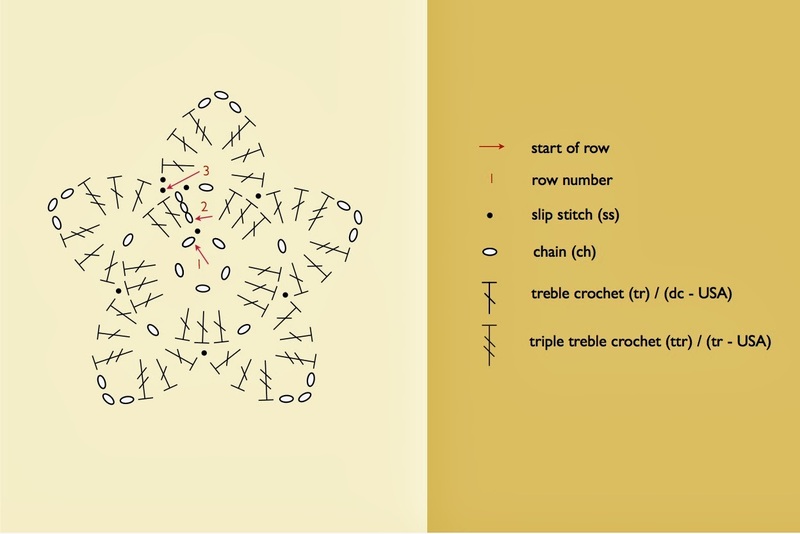 So nice of you to share the pattern! I'm also a big fan of the festive season and have been making decorations for a while now. My wreath is up on the front door: all crocheted! Now I'm doing my bunting. Isn't it fun?! These are lovely. I'm teaching my 7 year old grandaughter to crochet and I'm hoping she will manage to have a go at these. Thank you for sharing the pattern. Thank you, delightful pattern and idea! 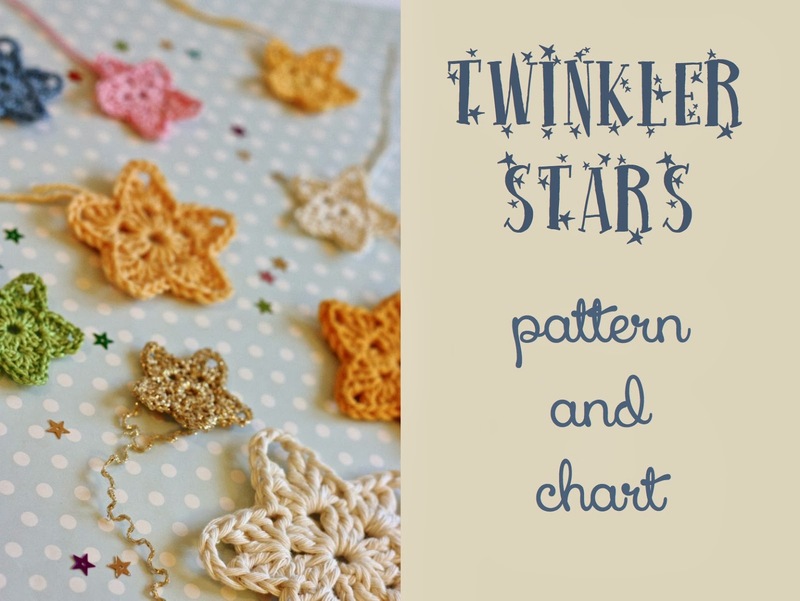 Lovely little stars - thanks for sharing the pattern! These are so fun! 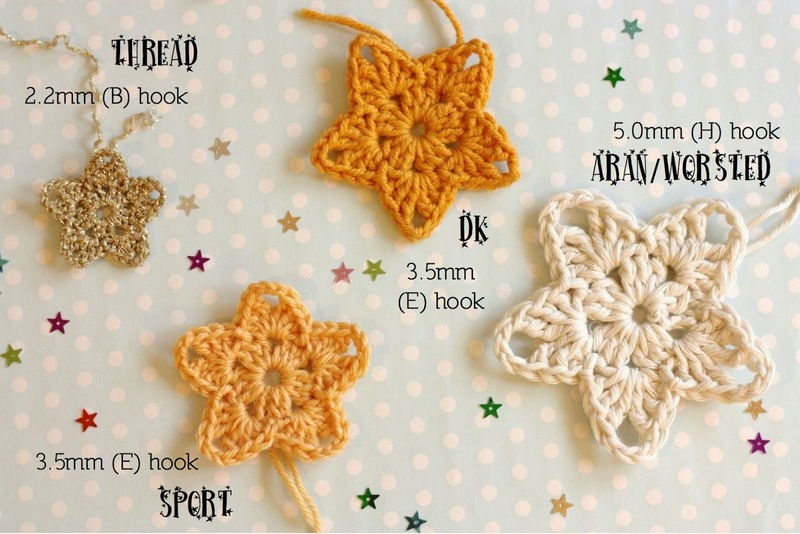 I really like little, sweet projects like this for my train journeys to and from work, I'll be making plenty of stars, thank you for such a clear pattern! Thank you so much for this gorgeous pattern! I've just had a go at one and it looks lovely! Perrfect for popping on gifts and the tree! I too so love this time of year, with the tree, the decorations, all the trimmings and lights. Ooooh I am loving these. 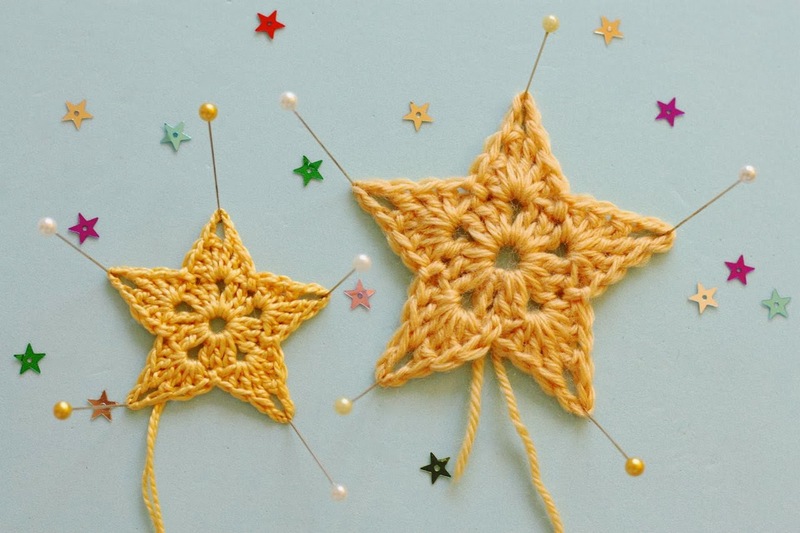 Am on the final straight of knitting a cardigan and have been determindly focussed on finishing it but I am going to break off to crochet some of these stars they are gorgeous. More crochet decorations..........my husband will be delighted.....not! Thanks again Sandra for sharing your creative ideas in such a clear and easy to follow way. Love them!!! They are definitely going to be part of my Christmas this year!!! Have a great day!!! these are great, I love the idea of adding them to gift wrap! They are so incredibly cute. I love them. i enjoyed reading in Mollie Make that your blog is one of Rachelle Blondel's faves.Love your stars, feeling inspired! Cute! Will need to hook some of those stars up myself. Thanks for sharing! Merci pour ces belles étoiles de Noël ! 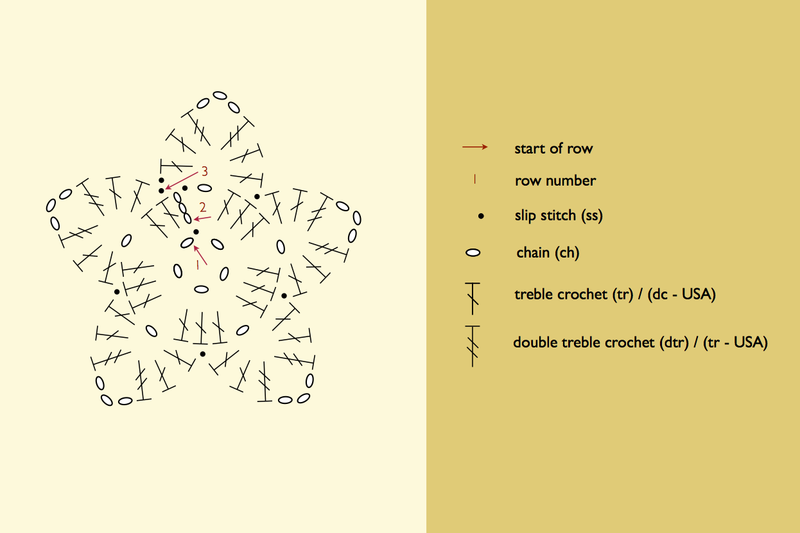 Yay a quick and easy star pattern! Quick question though, in the written pattern you call for a dtr, but in the chart, you mention a ttr. Which one is correct? Oh yes, I’d love to see, I’ll pop along now and of course I don’t mind that you altered it, that’s all part of the fun - making it your own! Sandra, you are so generous sharing this great star patten with all of us. Love your Twinkler Stars. Love your chart! Well done. 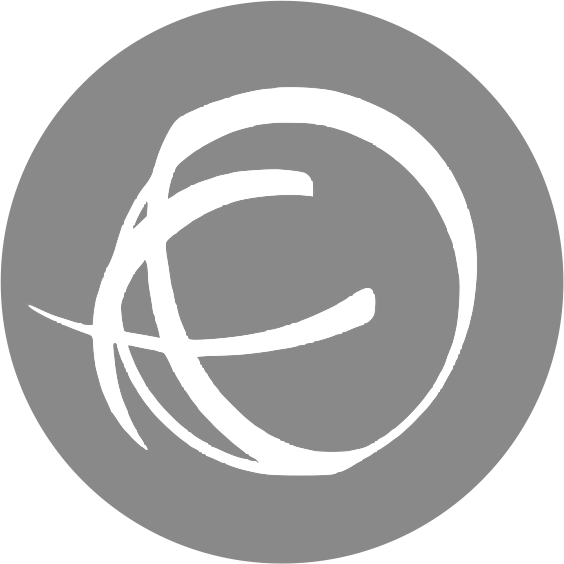 what software did you use. I want to make charts so badly but I haven't found a software that I like yet. Will make a star right now while waiting for my 12 year old to come back home from a school dance... Can't wait to hear her stories of the night. Beautiful, thank you! I'm also making stars now and will include these. And next year I'll start earlier. Thanks for the chart. They look so do able.You've got a lovely blog. 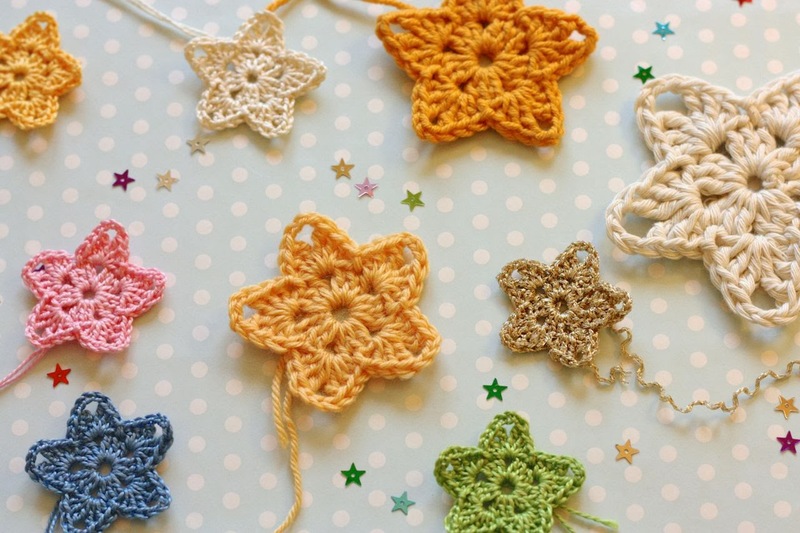 Thank you so very much for sharing your pattern for these adorable twinkling crocheted stars! It was so thoughtful of you!! I wish I'd have found it sooner, but there's always next Christmas! Merry Christmas to you n yours. Hi, I found your blog through Betsy Makes. Love your stars, I have been looking for a good star pattern so thank you for sharing! Thank you so much for your stars! they are so pretty and perfect for Xmas! You can see mine here, with a link to your page! I wish you a lovely Xmas with the ones you love! Hello!!! I used your star in mine Scrap LO. Thanks!!! I love your pattern!!! I used your star pattern to make a headband for my daughter. I love it. Please visit me at http://sanitybystitches.blogspot.com to see how it turned out!